It was nearly four years ago that we had the pleasure of meeting Hrvoje Baković on the island of Brač in the port town of Supetar and bathing in the fantasticness that is his “Plavac Murvica”. As we were updating the Dalmatia wine guide, we realized that we hadn’t gotten a hold of a more recent vintage of this Plavac Mali than the 2003. We were told that Richard Owyoung, who’s part of the fantastic team at our favorite wine shop Biondivino, was heading to Dalmatia on holidays and was interested in some Croatian wine advice. Naturally, we were excited to send all the information we could think of his way, and we mentioned how jealous we were. We also joked that we’d love to get a bottle of the Baković, never thinking he would actually bring it as we know very well that transporting wine on flights is no end of pain. Time went by and, to our surprise, a couple of weeks ago Richard wrote to us saying that he had a bottle of the 2005 vintage waiting for us. We were shocked and thrilled at the same time. We couldn’t wait to open it, and when we finally did with the proper food (some delicious handmade Ćevapčići), we saw that it was indeed the right wine. So, how does it stack up against the 2003? It’s a different wine, but still of the same level of craft as that vintage. If anything, it’s even more complex, while still being an excellent example of how well Plavac Mali can be made in Dalmatia. 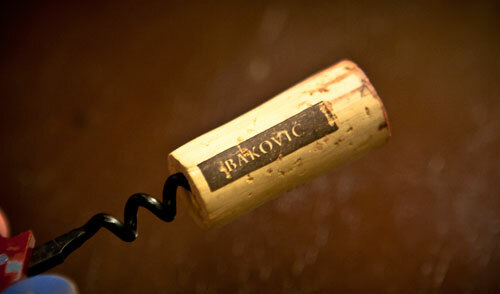 To read all the notes about it as well as the backstory on how Hrvoje came to make wine on Brač, check out the guide.